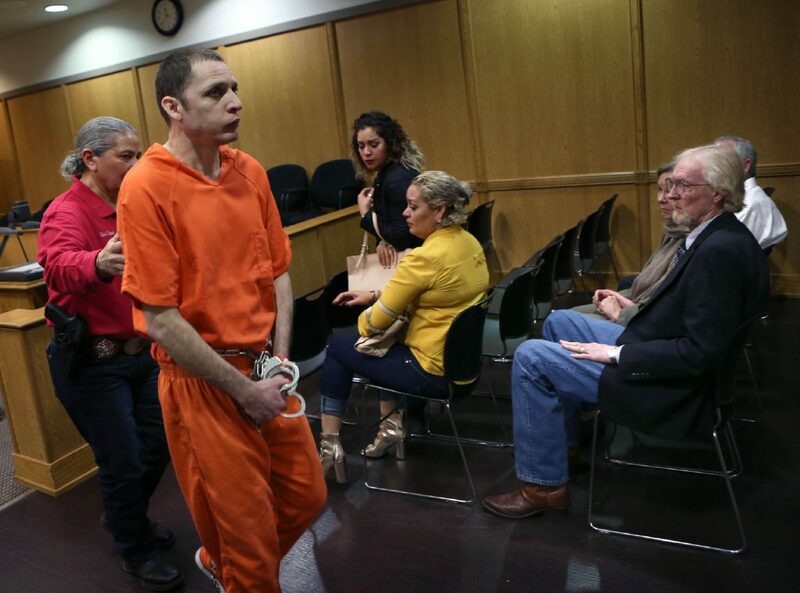 Angel Mario Garza walks past Martin Knell Jr., right, after pleading guilty to the murder of Martin Knell Sr. Tuesday, January 30, 2018, in the 370th state District Court in Edinburg. 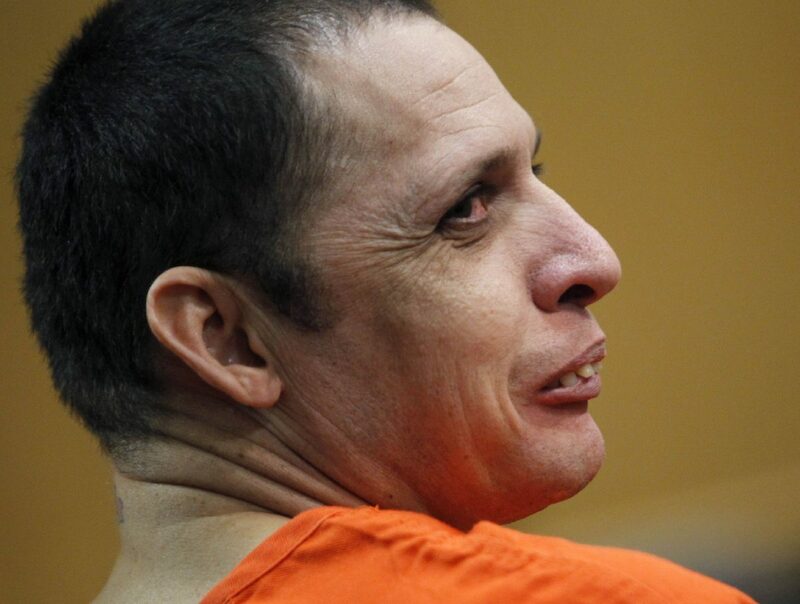 Garza received 45 years for the murder of Knell Sr. in January 2015. EDINBURG — Angel Mario Garza’s plea agreement went through a few last minute changes Tuesday, before he publicly accepted guilt for his role in the murder of an elderly man for money. 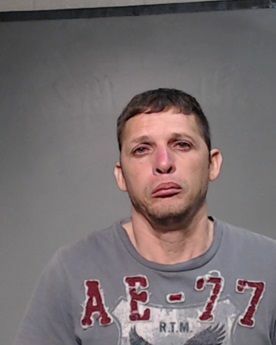 Garza, 40, pleaded guilty to murder, the lesser included offense on the indicted charge of capital murder, and was sentenced to 45 years in prison. He will be eligible for parole upon completion of at least half the sentence. He previously accepted a plea offer of 50 years. Garza is accused of helping his co-defendant, Monica Melissa Patterson, fatally suffocate Martin Knell Sr. in January 2015. Angel Mario Garza looks back to his family before pleading guilty to the murder of Martin Knell Sr. Tuesday, January 30, 2018, in the 370th state District Court in Edinburg. 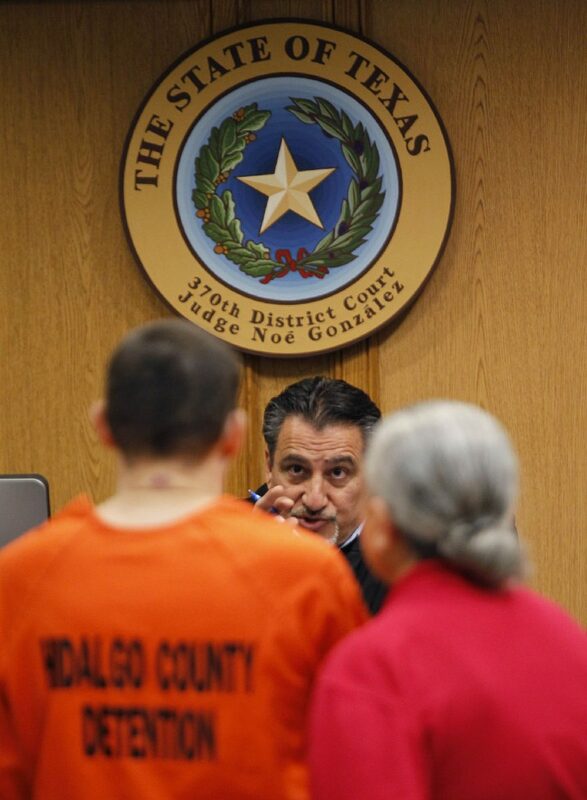 Judge Noe Gonzalez talks to Angel Mario Garza as Garza pleads guilty to the murder of Martin Knell Sr. Tuesday, January 30, 2018, in the 370th state District Court in Edinburg. A jury convicted Patterson, 50, of capital murder in November and witness testimony during her exhaustive trial revealed she had befriended 96-year-old Knell in the wake of his wife’s death to gain access to his substantial estate. At the time of Knell’s death, Patterson — who is now serving a life sentence — was executrix and a beneficiary of his will. Garza, who was arrested in August 2015, confessed to authorities that Patterson had promised to pay him if he helped her kill Knell, and said he suffocated the victim with a plastic bag while Patterson stood by. Patterson, however, did not keep her end of the deal, and Garza only received a couple hundred dollars. Garza was brought into the picture because, like Knell’s wife, his own father was a patient at Comfort House, the nonprofit hospice center where Patterson worked. According to witness testimony during Patterson’s trial, she agreed to let Garza’s father receive care at the facility if he did odd jobs at Comfort House. Knell’s only son, Martin Knell Jr., was in the courtroom Tuesday as were Garza’s sisters. Garza told the judge that he made a mistake and accepts his punishment. “I think I deserve it and I ask for forgiveness from the family that I’ve hurt,” he said in Spanish. The judge also reminded Garza that even though he was being sent to prison, he still has choices. The judge was alluding to Garza’s belief that he had no choice but to go along with Patterson’s plan. Because Garza is not a U.S. citizen, he will be deported to his native Mexico upon his release from prison.